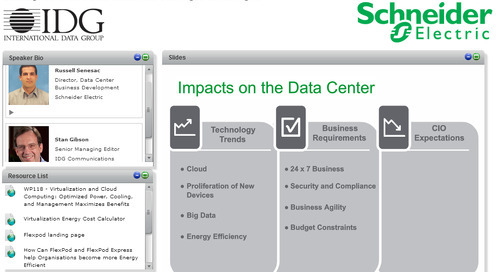 Proper site selection is crucial, taking a broad view of everything that might impact data center operation. I know of one project where the data center was flooded by a burst water pipe from an adjacent bathroom. Are factors like the location of water pipes, or local zoning ordinances that might impact after hours deliveries, or the possibility that nearby construction might tear up a power line, being considered as part of your data center design? They should be. Testing and commissioning can’t be rushed. Potential problems I’ve seen avoided by testing include one case where there was some faulty control programming for an automated shut down procedure in case of fires. The issue was that the logic shut engaged the fire suppression system and shut down the air conditioning just fine, but mistakenly kept the doors locked. The testing revealed the flaw, but in a real-life, untested situation, the people in the data center would not have been able to exit. Design with operations in mind. In one facility I’m familiar with, the lighting grid was placed right over the racks, making it necessary for maintenance people to actually climb onto the racks to service the lighting. Check out the webcast for more of these tips. With data center design/build projects, it’s important to at least have an appreciation for this range of best practices. Don’t assume every commercial builder or architect has this knowledge. Ultimately, it’s important for operators to have a trusted advisor for data center projects, while having more understanding for the range of factors that should be considered.